Image from the 1891 'Monster petition' for women's suffrage in Victoria signed by 30,000 petitioners. 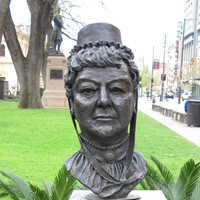 See also Adelaide, Petition No 1 seeking equal voting rights for both sexes in Federal Parliamentary elections - Executive of Women's Christian Temperance Union of Australasia. In this section we collect items that reflect the struggle to make government in Australia more democratic. We are building a picture and we acknowledge that this is not complete. Importantly, while there are matters to celebrate the story is fragmented across the six colonies that made up Australia before federation. As a result, we present some highlights in this section and across this website. In addition, there is the problem of drawing together a story from the past about people who have often been ignored in their own time and who have not been accorded recognition in the writing of history. We begin by highlighting some early developments in Victoria concerning the Eureka stockade and demands for more representative colonial government. We do not suggest that that colony was a leader for the women's suffrage issue. Credit must be given to the actions of women such as Mary Lee and Catherine Helen Spence in South Australia among many others. These women won the battle for women suffrage in South Australia before Victoria. The South Australian Parliament was the second to allow women to vote in the world (New Zealand being 1st). However more importantly South Australia was the first parliament anywhere (globally) to allow women to stand for parliament. This was before the UK, USA or Victoria. Indeed Victoria was the last to introduce women's suffrage and the right to stand for state Parliament. In addition, SA (and NT governed by SA) was the first and only state to allow Aboriginal voting. Voting for indigenous people in SA being limited to those few 100 persons enrolled at the time within SA post 1902 and thus federation. Unlike most other modern democracies, Australia does not have a Bill of Rights and there are few statements of rights in our history to draw on. The storming of the Eureka Stockade by police and soldiers took place on 3 December leading to the death of 22 miners and 5 troops. The Ballarat Reform League Charter and the Eureka Rebellion were precipitated by resentment that had been building on the goldfields concerning mining licence fees; overzealous policing of the licencing system; and perceived corruption of the legal system - after a Scottish miner was beaten to death and the alleged perpetrators were not prosecuted apparently because of the connection between one of them, a local publican James Bentley the local magistrate. However, when irate miners burnt down the pub owned by Bentley, three miners were quickly arrested and charged with arson. In addition to the detailed demands for democratic governance set out above the miners demanded the release of the three alleged arsonists and the abolition of the licence. In 1857 the Victorian Parliament passed a Bill that provided for universal white male suffrage not tied to property ownership. The 'Monster Petition' of 1891 in Victoria sought the right to vote for women and echoed the words of the Ballarat Reform League Charter, as well as President Lincoln, John Stuart Mill and the American revolutionary movement. These words express principles that are universal and enduring. This section highlights the inspiration for the Monster petition.